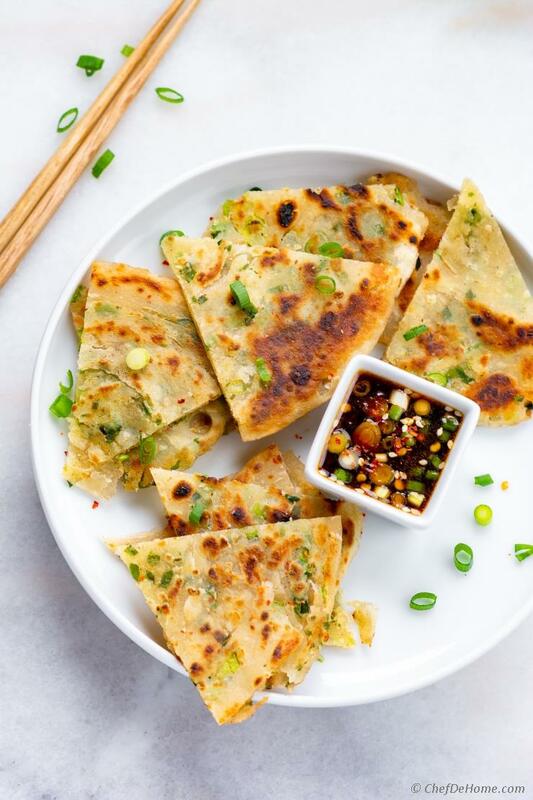 This recipe for Scallion Pancake and amazing Ginger-Sesame Soy Dipping Sauce will help you make the restaurant-style flaky and chewy Chinese Scallion Pancakes at home. Serve as an appetizer or snack. For me, three things make Scallion Pancakes taste just like served in Chinese restaurant. Flaky layers and chewy texture of pancakes. Irresistible Sesame-Soy Ginger Dipping Sauce served with pancakes. Good news is - I'm sharing today all secrets to make pancakes which have all three qualities listed above. 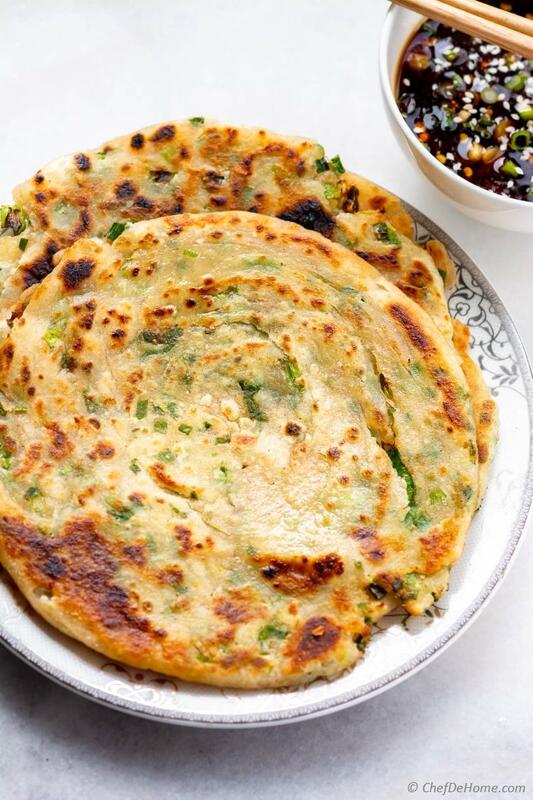 Pretty much everything you need to know to make THE perfect Scallion Pancakes. Let's learn to make some and serve something different for your family gathering. 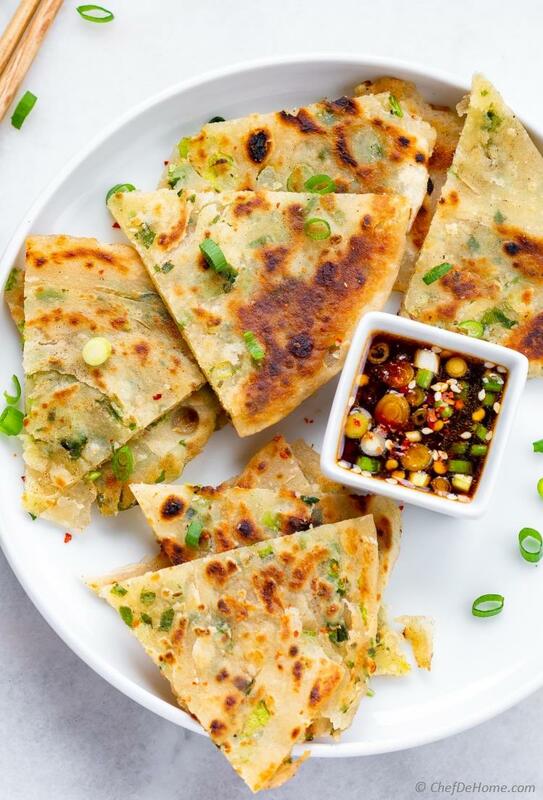 Scallion or Green Onion Pancake is signature appetizer on every Asian restaurant's menu. The seasoned wheat flour dough is layered with green onions and rolled to make 6-7 inch flat bread. Flat bread is then shallow pan fried in cooking oil until both sides are crispy. The resulting pancakes resembles cooked stuffed tortilla and have buttery layered texture somewhat like a cooked puff pastry. The flavor fresh stuffed green onions can't be missed. When hot pancakes are dipped in sharp dipping sauce... a flavor explosion happens! 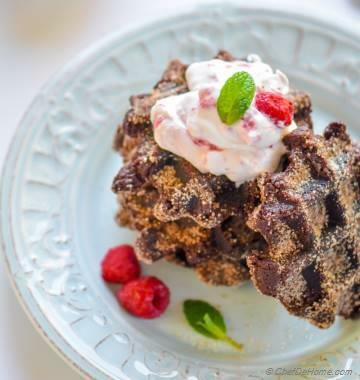 I highly recommend trying this recipe once. It will be repeat offender for sure. 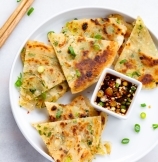 The dipping sauce recipe for scallion pancakes is ginger-sesame soy dipping sauce. It has sharp and delicious ginger-sesame soy flavor with lite flavor of scallions. It is easy to prepare and a versatile condiment. It is perfect to serve as Dipping Sauce with Scallion Pancakes, or Chinese Dumplings, or Spring Rolls. It is also a great marinade to make Ginger-Sesame Grilled Chicken. To make dipping sauce for Scallion Pancakes, I add all ingredients for dipping sauce: grated ginger, sesame oil, sugar, rice vinegar, soy sauce in a small bowl. Whisk to mix sugar with oil and soy sauce. Then mix in sesame seeds and scallion. This simple recipe has sharp and delicious ginger-sesame flavor. This Dipping Sauce keeps good in refrigerator for up-to 1 month. If serving later, I recommend to mix-in fresh chopped scallions just before serving. To make perfect scallion pancakes, first step is to get dough right. Dough for Scallion Pancakes is called Hot Water Dough. It is made making dough of wheat flour with oil, seasoning and hot water. Hot water gives pancakes signature chewy texture. Fat (oil or butter) helps in flaky cooked Pancakes. To make the dough, in food processor, or wide bowl, add flour, butter or oil, salt, and minced garlic. Start with adding 1/2 cup of hot water. Pulse to mix water with flour. (Mix with wooden spoon if using bowl.) Add a tbsp more until dough comes together. No more than 4 tbsp of water. Dough should not be very wet or sticky. Once dough has formed, letting it rest makes it soft and easy to work with. The resulting pancakes are soft, flaky with perfect lite chewy texture. Simply irresistible with Soy dipping Sauce. This is very important step in getting signature multiple flaky layers in pancake. The rested dough is flattened, brushed with oil, layered with minced scallions and rolled like a log, then spiraled and flattened again. This creates multiple layers of oil layered dough. When cooked, layers separate to flaky crispy layers of pancakes just like a puff pastry. Once ready, I slice pancakes into triangles just like you would slice pizza. Serve still warm Scallion Pancakes with dipping sauce and have a Chinese Restaurant made-at-home. I hope these pancakes will make to your next family gathering. Pancake Dough stays good in refrigerator up-to 2-3 days and dipping sauce stays good for up-to 1 month. 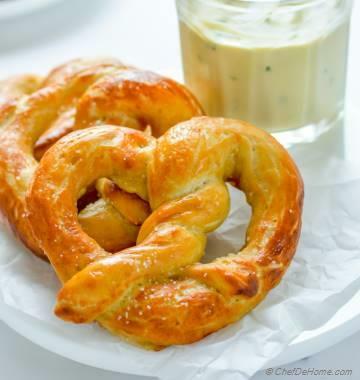 So, you can make dough and dipping sauce ahead of time. Just roll and cook pancakes when planning to serve. Total Time 50 minutes Prep Time 25 minutes Cook Time 25 minutes Difficulty Easy Yields 8 Servings Serves 8 Notes No. of servings depends on serving size. 1. In food processor, or wide bowl, add flour, butter, salt, and minced garlic. Start with adding 1/2 cup hot water. Pulse food processor to mix water with flour. (Mix with wooden spoon if using bowl.) Add a tbsp more until dough comes together. No more than 4 tbsp water. Dough should not be very wet or sticky. 2. Take dough out of work board dusted with flour. Knead for 1-2 minute. this step makes dough pliable, and soft. Cover and set aside to rest for 20-30 minutes. 3. 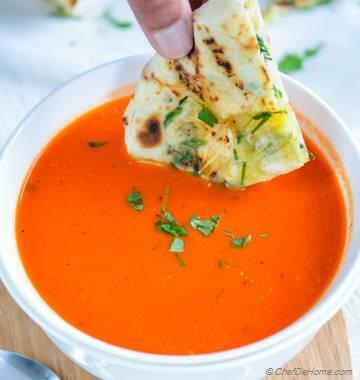 Dipping Sauce: While dough rest, prepare dipping sauce. 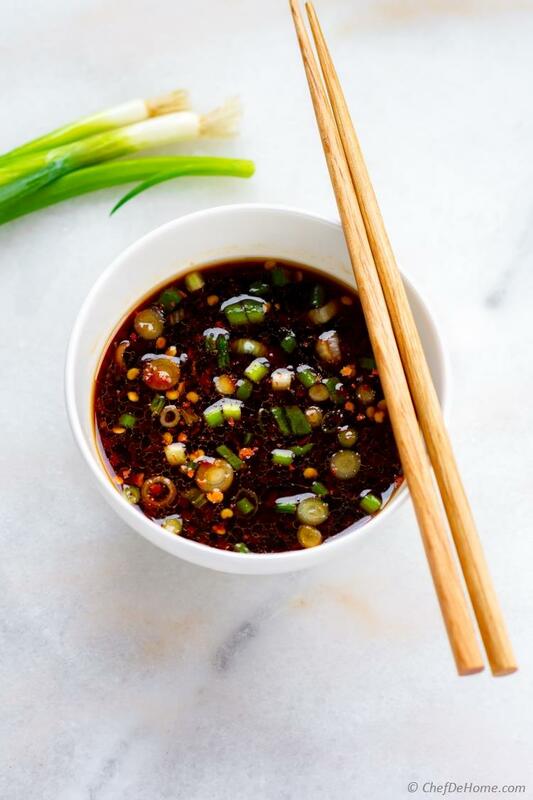 In a small bowl, add all ingredients listed for dipping sauce except sesame seeds and scallion. Stir will to make sure sugar is dissolved. Mix in scallions. Top with sesame seeds. Set aside. 4. To make pancakes, divide resting dough into 3 equal portions. Cover two portion with towel, take one work board dusted with flour. Roll it to 9-10 inch wide circle. (use dusting of flour as or when needed) Brush rolled circle with coat of cooking oil. Make sure to cover fully including edges and center. 5. Sprinkle chopped scallions on top distributing evenly. Starting from one side, roll it tight to make a log/roll cigar. Coil the log in a spiral. Tuck loose end under the spiral. Press gently to flatten it. 6. Dust in flour and roll gently to a 4-5 inch wide circle. Dust with flour as or when dough appears sticky. Repeat steps 3-6 to roll all pancakes. Cover rolled pancakes with dry kitchen towel. Don't skimp too much on oil or pan cake will look like dry flat bread. 8. Brush hot butter on cooked scallion pancakes. Slice in triangles. Serve with dipping sauce. Enjoy!